In preparation for my trip to Rome this weekend (to be followed by a week in Tuscany! 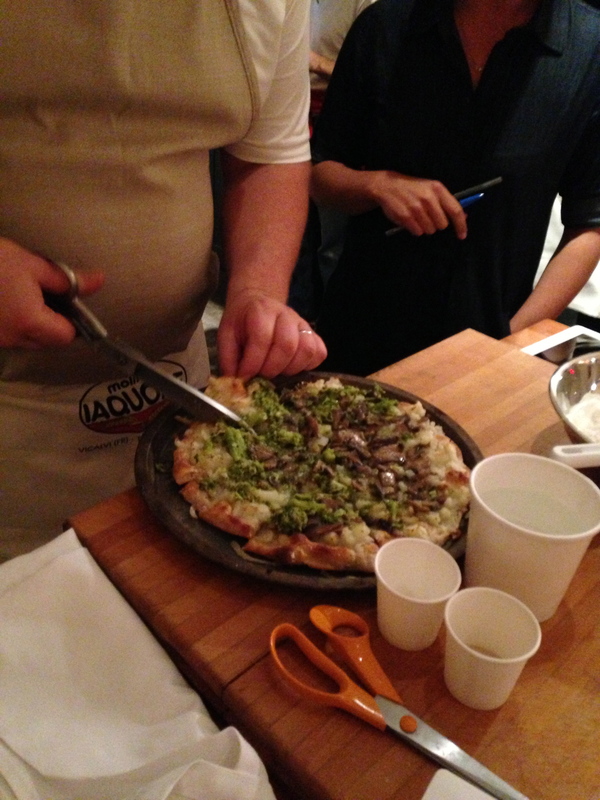 ), I had the opportunity to take a pizza making class with one of Italy’s most celebrated bakers, Gabriele Bonci. 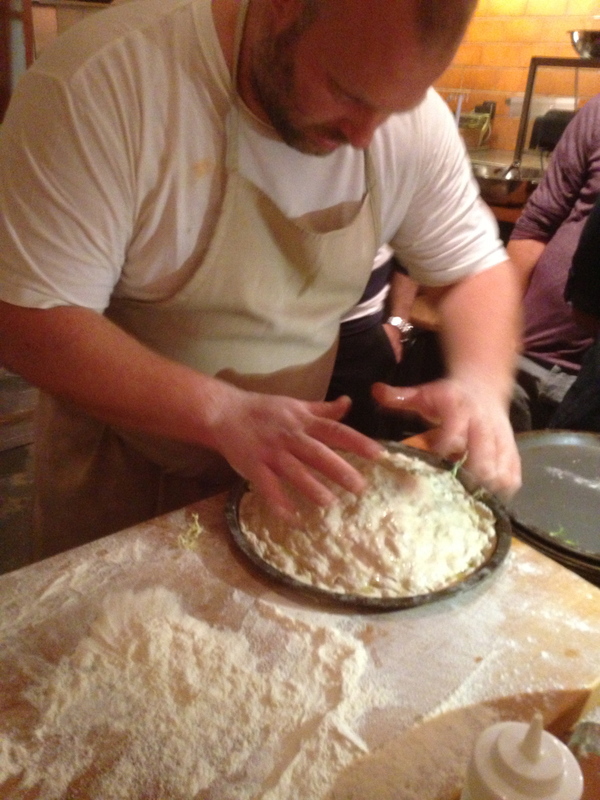 Bonci is the founder/owner of Rome’s famous Pizzarium, which I will be visiting and reporting on when in Rome. But before I leave, I wanted to share a few pictures of the carb-filled night. 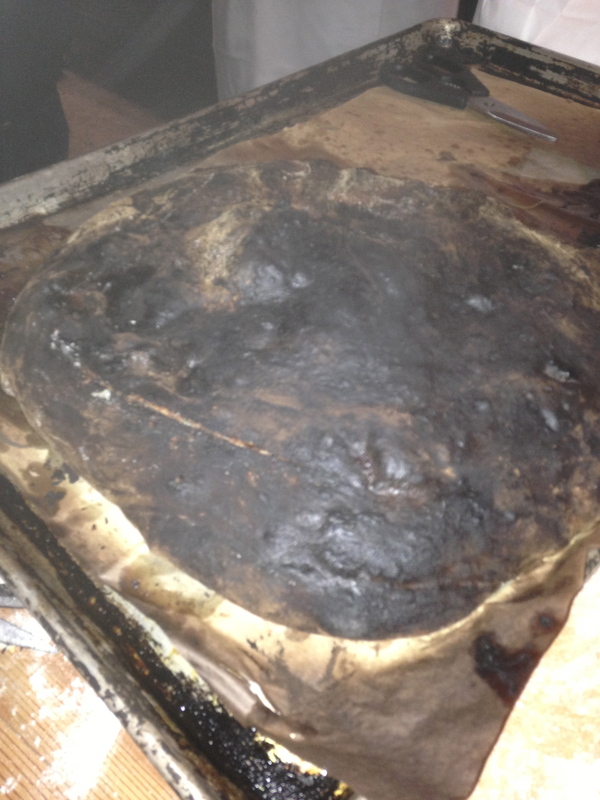 Those of you who want to try making Roman-style pizza at home will have to be patient. I’ll be working on getting some delicious recipes to you in November after I return from Italy. We started off the night with a slice of pizza before Bonci even began speaking. He doesn’t use a pizza cutter or knife, just a very large pair of scissors. After teaching us how to make pizza dough (don’t worry, I’ll eventually teach you his method), he started making several different types of pizza to try. 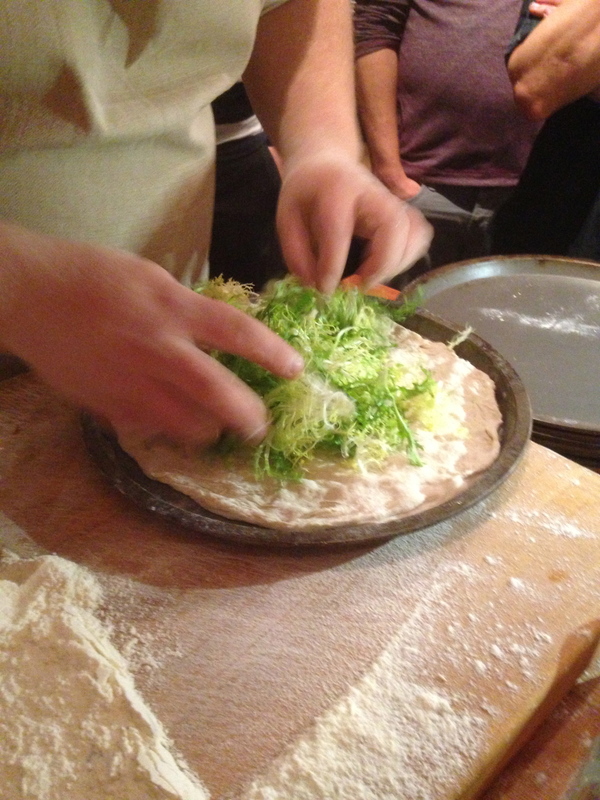 One of my favorites was a pizza stuffed with curly endive (otherwise known as frisee or curly escarole). He then drizzled the raw vegetable with olive oil and sprinkled with salt. 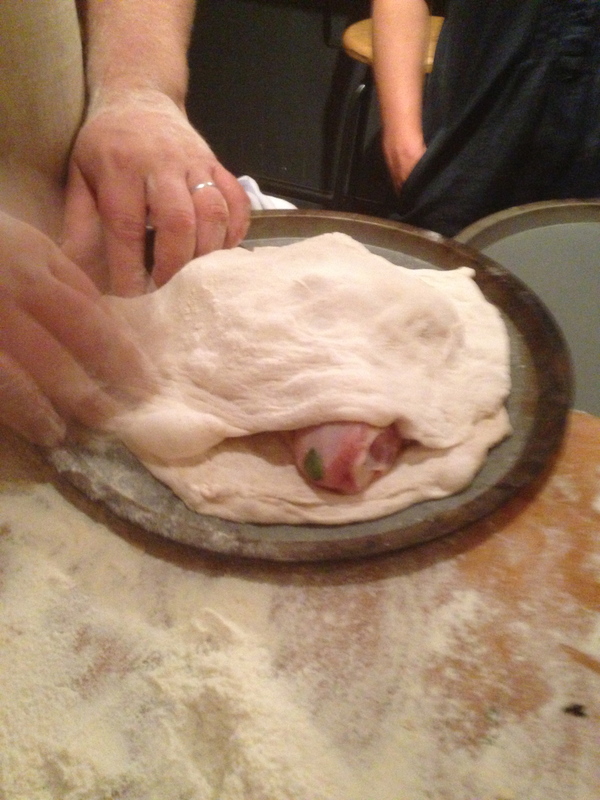 Then topped with another layer of dough. 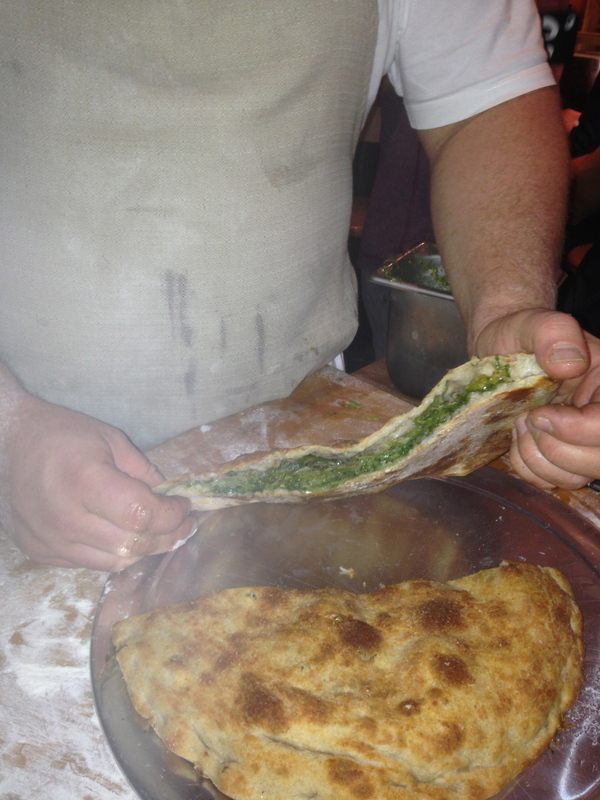 After baking, out popped this golden beauty….crispy, chewy dough filled with lightly cooked greens. Yum. Next up, sausage with broccoli. But wait, this is not your average sausage and broccoli pizza. 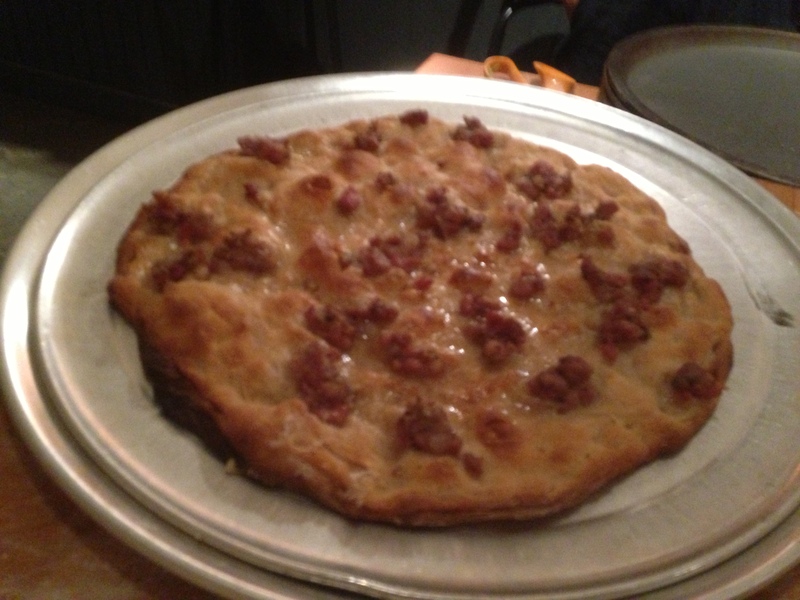 Dough topped with raw sausage, then baked in the pizza oven. After getting all crispy, chewy in the oven, it is topped with broccoli that has been previously cooked with olive oil and garlic…. 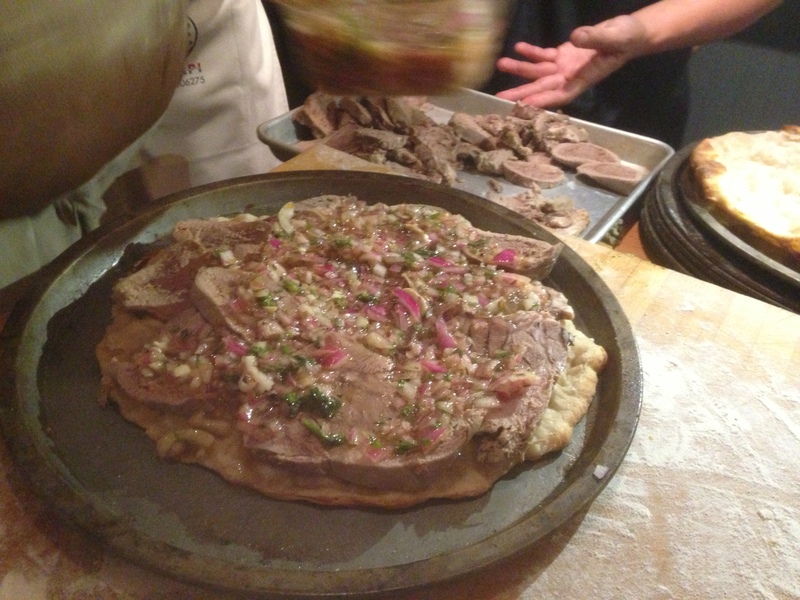 There was also beef tongue with an agrodolce (sour and sweet) preparation of red onions. 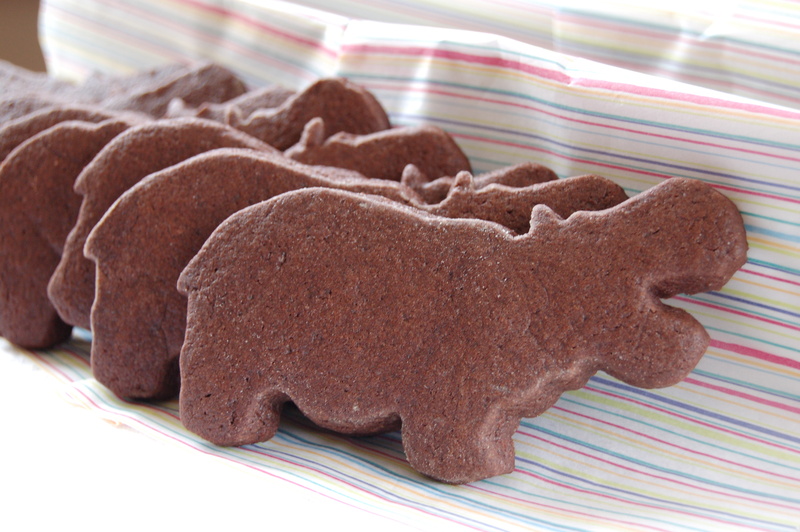 I tasted it, but probably won’t be posting this recipe anytime soon. 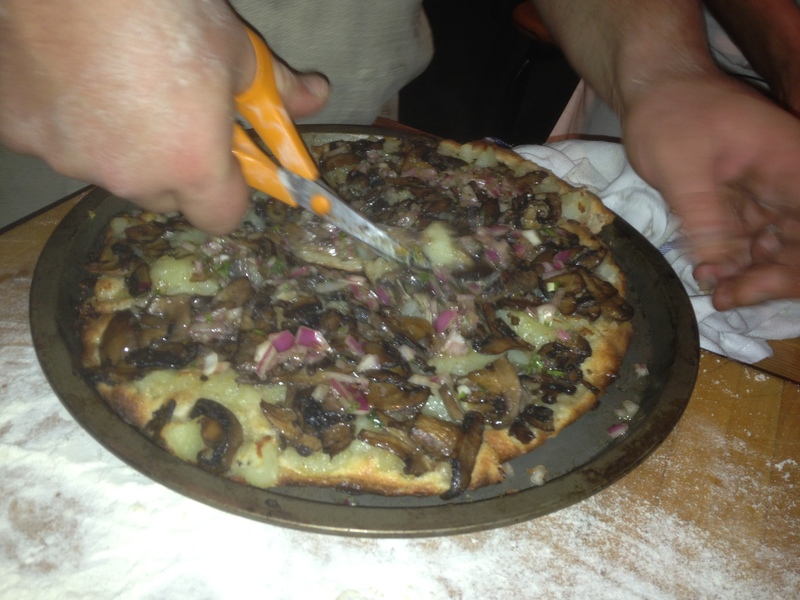 Another favorite, potato and mushroom (topped with those sour-sweet onions)…. 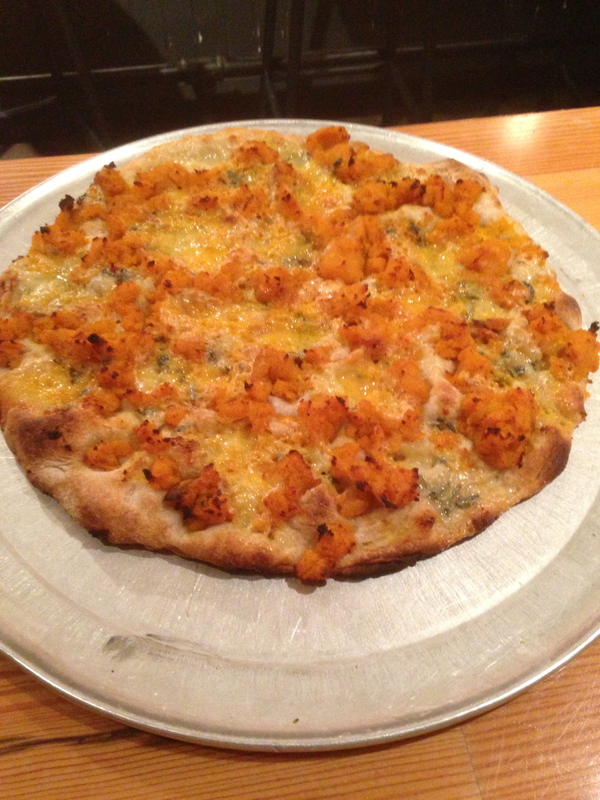 And the pumpkin with gorgonzola…. 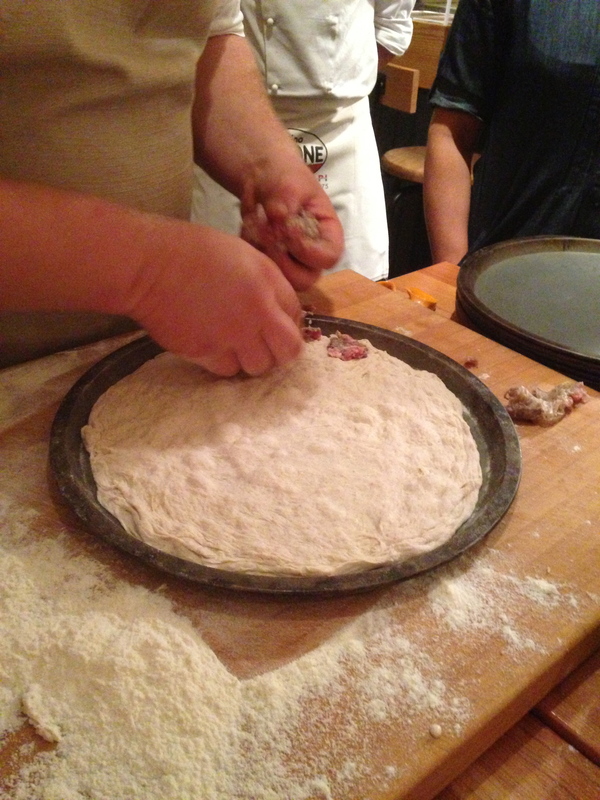 One of the most interesting uses of pizza dough was as a vessel to cook whole pieces of meat. 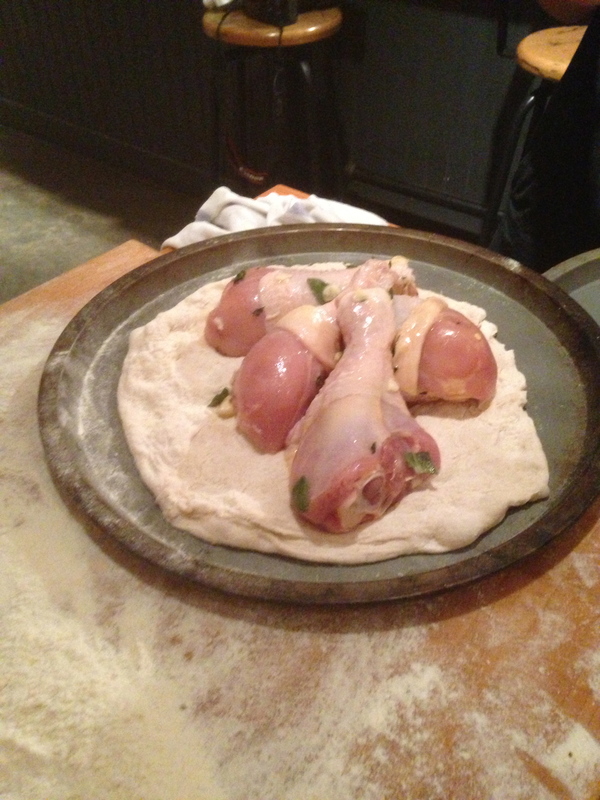 First, the dough is pressed out like preparing pizza, the chicken legs (you can use any meat) and herbs are placed on top. 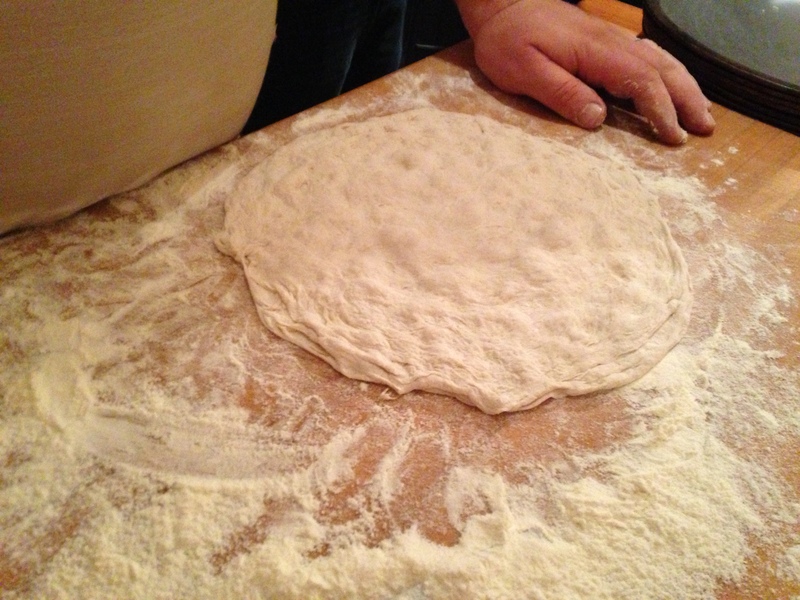 This is topped by more dough…. And bakes in the pizza oven for a couple of hours. 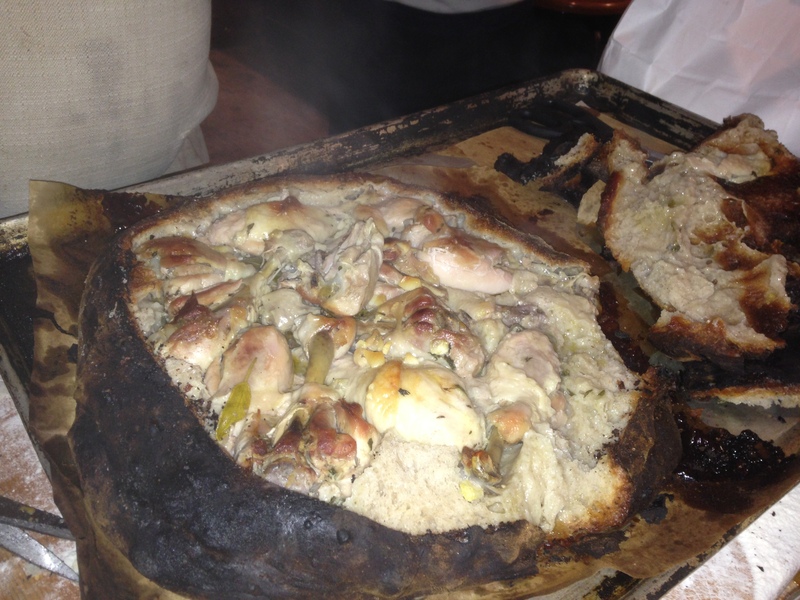 The charred crust is opened up to reveal some of the moistest, most succulent chicken you’ve ever had…. 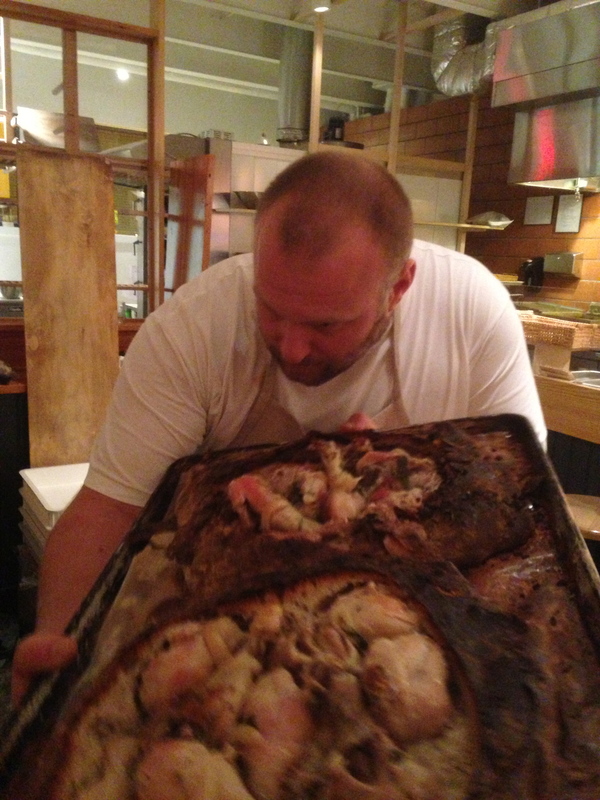 And Bonci is VERY proud of his chicken…. So, I’m off to Rome, then Tuscany. I will keep you up to date on all of the fabulous foods (and hotels) that I find. Upon my return, be on the lookout for some amazing Italian foods (not just pizza!) that I will teach you to make in your home. 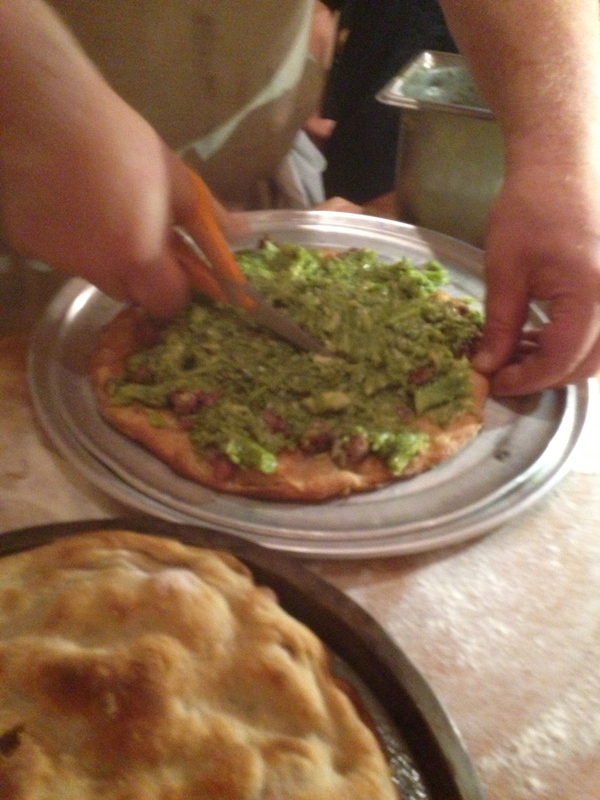 I’m loving the endive pizza as well as the pumpkin/gorgonzola–very unexpected combinations. I know you are collecting new experiences in Italy. Breathless with anticipation to see with what you may return.